Joyce uses her background in floral design to extend to the aesthetics of interior styling and event designs. Based in Hong Kong, she can be found working on floral arrangements, styling with collectibles and antiques, travelling, and enjoying her private time with her husband Stephen, and two furry animals Aki & Soufflé. She also believes in the art of crafting a unique private event in a way that beautifully present your personality & your taste, your dreams. Her work is a combination of timeless beauty with a natural sophistication. We execute events with our trusted vendors and team, specializing in floral installations in Hong Kong, and creating destination events design in the UK, France, Italy, and Asia. We believe in truly graceful occasions that is fully enjoyable in a lifetime. We partner with some of the most prestigious venues in the world. Our Work has been featured on Style Me Pretty, Wedding Sparrow, Magnolia Rouge, Snippit & Ink, Elizabeth Anne Design, Bride & Breakfast and more. coordinating different aspects of event aesthetics and experiences. We provide bespoke floral design services to our Corporate and Private clientele who are based in Hong Kong. We provide bespoke floral styling solutions for Prestige Brands, as well as Weddings clients. With more than 9 years of floral design experiences, Joyce is a keen instructor of floral workshops to be hosted in Hong Kong and beyond. Please stay tuned to our upcoming workshops. This is the second series of the Lyrique Floral Masterclass. The class was about doing floral installations so we have a group of florists who joined the class and shared our journey of flower arranging. We arranged dried flower bundles and olive foliages as centerpieces to go with the ceramic workshop. A beautiful day for a new born celebration at Sevva Hong Kong. Joyce helped created the concept of a vibrant floral garden by using seasonal Japanese tree branches and blooms such as clematis, yves piaget garden roses and tulips. Joyce was invited by A Event Group to design floral long tables for the Net-a-Porter private dinner event at The Verandah, Repulse Bay. The theme was chic modern with a mix of black and purple elements, resembling a fashionista mood. We have hosted our first Lyrique Floral Masterclass at Makerhive at Kennedy Town. It was a collaboration was Myrtle et Olive and we have came up with a more vibrant peach floral theme for the first series. Joyce was invited to design the floral installations for Cartier Etourdissant event hosted at SKY 100 Hong Kong. The idea was having a transitioning color of floral arrangements in a modern look for the whole private dinner area. All the guests were greeted by the Cartier Spring Garden at the venue entrance. We used a lot of alchillea and ammi to setup a floral immortel garden for L’occitane en Provence at the Murray Hotel. Joyce was asked by one of her favorite graphic designer, Beverly Chan, to decorate a birthday dinner table at Duddell’s Hong Kong. With a brief of oriental elements and modern textures, we incorporated the use of gloriosa and chinese ceramic into the tablescape design. To celebrate the launch of the new black tea product, Fresh hosted this glasshouse event at Grand Hyatt Poolhouse. Using lush greens, and black tea colored flowers, we created test tube florals for all the long tables and product display stations. Joyce has been invited to design a Dior Garden set up at Le Dome de Cristal to celebrate the launch of the Dior Prestige product and the sharing of La Rose de Granville concept to everyone. Followed by a lovely flower class on the day, the clients created their very own fragrant garden roses arrangement. The brand has transformed the Four Seasons Ballroom into a Royal Palace for Cartier. Joyce designed signature red floral arrangements for the tables with a royal parisian look - topped with seasonal goose berries & grapes for a delectable dinner celebration. 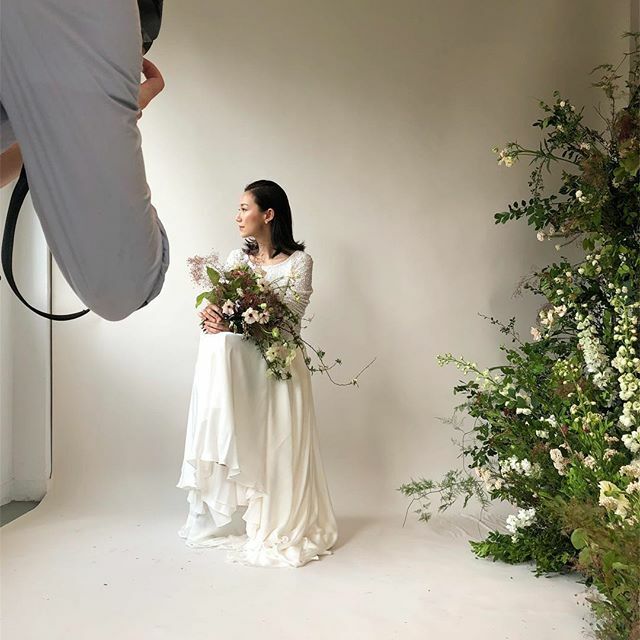 To celebrate the launch of the limited edition of the Blue Skies & Blossoms fragrances, we have been very excited to partner with Jo Malone London on this Press day event introducing the fragrances with seasonal spring flowers. With Rose tea, flowers & finger food to make a perfect fragrance afternoon. Joyce was invited by a lovely British Perfumer Penhaligon's to do floral demonstration workshop for the Ostara launch at The Pawn in Wanchai. Inspired by daffodils and the bulb-to-bloom process, we've incorporated a handful selection of spring flowers - Narcissus, Tulips, Mimosa, Muscari & Phlox to this workshop, witnessing the magic of blooming.